When people look at me they see a girl who wears black most of the time. That’s their dominant narrative of me, but they don’t know who I am until they meet me. They think that I’m depressed or emo and they sometimes tell me I dress like a boy. But I do buy men clothes and wear them because I like them, I feel like it suites me. Wearing boy clothes is not a bad thing. You get to express yourself how you want too. I wear boy clothes and feminine clothes and I am happy of how I express myself. That’s my gender expression. Many people assume a lot of things about me but I don’t really pay attention to the things they say because I know who I am. I see myself as someone full of color, full of joy. I am always full of laughter, I am someone who can’t hate or be mad at people. I am such a gentle person, yet so strong. That is a chosen identity I have chose for myself, to be happy and full of joy, and that is why my background has so much color. I chose all these objects because they all have so much meaning to me. I want to travel. I want to have the experiences my sister had when she went to the Dominican Republic and helped little kids learn English. All the stories she told where so life changing, and it’s something I want to do. The picture of my family well, thats us. We have gone through so much together but we are still here every second of every day together and closer then ever. Many people may believe and assume many things about me but I will enlighten them with my counter narrative. Breaking the Dominant Narrative by Natalie is licensed under a Creative Commons Attribution-ShareAlike 4.0 International License. 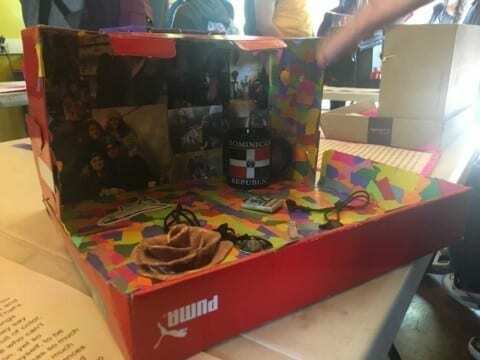 I am very surprised on how beautiful your box is because I love all the color you incorporated into it. I like the fact that each symbol means something to you and who you are. Your a mom I LIKE YOUR SHADOW BOX!! !